When you get hooked on a book series, feverishly reading each and every one, it can seem like a good friend has died when you finish (okay, after you finish re-reading the entire series three times). That's how I felt when I finished Diana Gabaldon's "Outlander" series. I was thrilled when I found the television series based on the novels and watched the first two seasons multiple times. At that point, I discovered Winston Graham's "Poldark" books. Read all of them. Watched the PBS series. Now what? 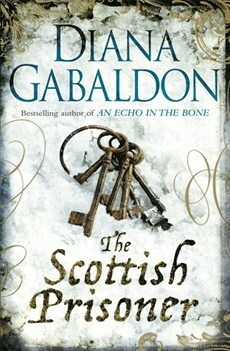 Gabaldon gave in to her legions of tormented fans and took up the task of writing yet another "Outlander" book, but it takes time. I looked to see if she had written anything else, and discovered that she has taken one of the more popular men from the series, Lord John Grey, and written several books where he is the central character. Although any "Outlander" devotee wants the focus on Scotsman James Fraser and his wife, Claire, I was willing to give it a go. Gabaldon's mastery of the historical novel is impressive, and The Scottish Prisoner fills in gaps of time that exist for Fraser while it shows how Fraser and Grey's deep and richly complicated friendship developed. While the crackling romance between Jamie and Claire isn't in this book, she is there is spirit as he sadly yearns for her. No man spends twenty plus years doing nothing but pine for his lost (he believes) wife, and this book paints a fuller picture of the Scotsman's efforts to find reasons to continue to live. It also helps me wait for both the next "Outlander" novel as well as season three of the television series. Kathleen Barker was born and raised in Baltimore, Maryland. A graduate of Blessed Sacrament, the Institute of Notre Dame and Towson University, she spent twenty years as the much-traveled wife of a Navy pilot and has three children. While working for a Fortune 500 insurance company in New Orleans, she wrote feature and human interest articles for their magazine and received the Field Reporter of the Year award. After Hurricane Katrina, she returned to her beloved state of Maryland where she started work on "The Charm City Chronicles". All four volumes, "Ednor Scardens", "The Body War", "The Hurting Year", and "On Gabriel's Wings" are available in Amazon's Kindle store. Remember to enter our 6th Blogiversary Mystery Box giveaway. The Scottish Prisoner was by far my favorite John Grey book. Loved it! So, did you read all of her "side" series books on John Grey? I've just read one so far, to determine whether I cared for one focused on Grey.